This painting has a double meaning. 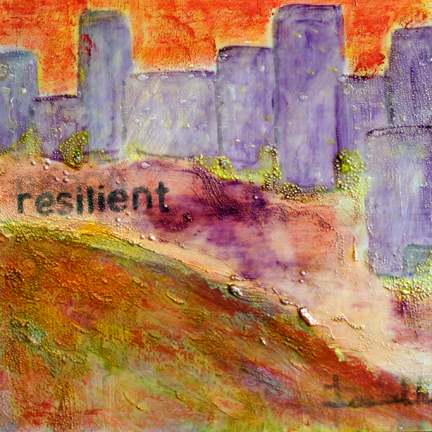 I embedded PEACE under the area where the word RESILIENT is. It didn’t show up during the first layers, but when I added the final coat to seal it, it started to show through… Two for one, so to speak. This entry was posted in art and tagged peace, resilient. Bookmark the permalink. We just spotted the word peace. Nice one. Have a terrific Tuesday. Thanks… glad you found PEACE. You have a great day too. I love the peace showing through! I love the play between the two words, the colors and setting you have created. Thanks so much for your comments… Glad you like it. Wow, love this painting Lou! Just gorgeous! really wonderful. gritty and beautiful at the same time.